On the Studio To Go desktop, Sweep plays a stereo track into the Jamin mastering tool via JACK. If you're attracted by the idea of Linux and open-source music software, but put off by the thought of installing it on your PC, there's another way: a bootable CD-ROM containing both the OS and all the software you need, ready to go. It's certainly possible to produce and record music on a Linux system, but setting up the machine could be a challenge for many people without experience of the platform. With nearly all of the source code available on various Internet sites, the DIY route is feasible if you have the time to figure out how the pieces fit together. While that's undoubtedly the best way to learn about the technology, it could present a frustrating learning curve for those musicians who just want to get going. One way of hiding the unfamiliarity of novel software is to put it inside devices that resemble traditional equipment — the Hartmann Neuron resynthesizing keyboard and the Muse Receptor rackmount VSTi host are both in this class, with Linux systems running inside. Another approach is to do what Apple have done with OS X: select a particular combination of open-source software, add some user-friendly components on top and market the result as a single product, along with technical support services. Fervent Software have done something similar to Apple with Studio To Go, which takes the form of a single, bootable CD-ROM. Linux is available in native versions for just about all processors, including the IBM chips found in the Apple G5 machines, but since most people have PCs, Studio To Go was compiled for the Intel 32-bit architecture, which includes the Pentiums and the Athlons. Because Linux-based systems are licensed in a very different way to proprietary software products, it's quite legitimate to use the same software on any number of machines you have access to. The principle behind these 'live' Linux distributions aimed at musicians — and there are now at least half a dozen available — is that you can have all your music-making tools in one portable package, without needing to carry a laptop around. These distributions load the Linux software into the available RAM and won't touch any software or data already present on the hard disk, unless you want them to. A USB memory stick is a popular complement to live distributions, as it allows you to take personal data and settings around with you. The bootable format has both advantages and disadvantages. On the plus side, the software isn't tied down to any particular machine and there's little risk of damaging the system other than by breaking the CD-ROM itself. On the other hand, loading software from CD-ROM is slower and noisier than loading it from hard disk, and will become tedious if the PC isn't a recent one with plenty of RAM. Most live distributions offer the possibility of a permanent install to hard disk if you're happy to wipe the system or data that's on there already. Fervent Software are the first company to produce a live Linux distribution for musicians in a retail package with a technical help service: buyers of the boxed set can register for 30 days' support by email and in customer forums. The company intend to market this product to both home-studio users and the education sector, the idea being that students will be able to have access to a full suite of music tools which they can take home and use without the fear of a raid from the software police. To this end, Fervent Software intend to offer volume pricing deals to educational institutions. A PC compatible with 32-bit Intel software. 800MHz Pentium minimum; 1.2GHz or faster recommended. 256MB minimum RAM; 512MB or more recommended. Any sound/MIDI chip set with ALSA driver available. CD-ROM drive, the faster the better. 2GB or more hard disk space for optional hard disk install. I tried Studio To Go with a 64MB memory stick on generic Dell and Acer PCs, and my own Opteron-based workstation, which was built specifically to run Linux audio software. First, you have to make sure the PC is booting from CD rather than hard disk. Once that's taken care of, there's a whir from the CD-ROM drive and a boot prompt appears. At this stage you can press the Enter key for default settings, or choose from several boot options if automatic configuration has failed on a previous attempt. Assuming everything works on your particular PC, you then see a loading screen followed by the KDE desktop, which should feel familiar to anyone coming from a Windows or Mac background. The Dell machine threw up an immediate problem: the screen resolution was a pitiful 640 x 480 instead of the 1280 x 1024 I would have expected. The auto-configuration of the display had not worked properly, and a Google search demonstrated that this was a known problem on this specific model — the amount of video memory allocated by the BIOS was only 1MB. Linux can sometimes highlight cases where hardware is buggy, and PC manufacturers bodge a machine to get it working with Windows XP and out of the door as quickly as possible. A flash update with a newer BIOS, available on demand from Dell technical support, is the proper solution in this case. Other than the resolution problem, the Dell machine worked smoothly, with program launching reasonably responsive and the JACK sound server distributing audio between applications without buffer glitches, or xruns as JACK calls them. The same couldn't be said of the bargain-basement Acer PC, which required an increase in the number of periods per buffer to process audio properly, and suffered from serious delays when launching applications. This isn't really the fault of Studio To Go, since there are a lot of PCs out there which just aren't up to the task of working with real-time audio, and JACK, by design, is extremely unforgiving of inadequate machines. The lack of performance on the Acer PC could have been due to low-quality hardware, or perhaps daft interrupt assignment. Disabling ACPI in the BIOS was suggested by Fervent Software as a possible fix; poor implementations of this standard also cause problems with Windows XP on certain PCs. Studio To Go provides access to disk partitions. Drivers from the ALSA project are included in a single package, so Studio To Go either will support your sound hardware or it won't — since a live distribution is run from a read-only disc, you can't download drivers to it. To sum up the current status of ALSA driver support: PCI cards and motherboard chip sets tend to work, some PCMCIA interfaces have drivers, USB devices work if they are standards-compliant, and Firewire devices can be assumed not to work. This is not due to a lack of Firewire support under Linux, but because audio interface manufacturers hardly ever stick to the proper Firewire specification, and they won't release the details of their non-standard protocols. This is a particular problem with Mark of the Unicorn equipment, and as a result hardly any MOTU interfaces are supported under Linux. It's something to consider when choosing an interface, as a closed design means you will always be dependent on the manufacturer for continued driver support, regardless of whether you use Linux, Windows or OS X. The converse of this problem is that some sound hardware is supported by ALSA even though it has been discontinued and does not have Windows XP drivers available — an example would be the Midiman DMAN PCI card. On my Opteron machine, which has a Matrox dual-head video card, the display was configured perfectly on the first boot without any tweaking required. The M Audio Audiophile PCI card was correctly detected and configured, with JACK starting automatically at a conservative buffer size. A row of icons on the left side of the desktop provided access to disks on the host machine and the USB memory stick, while folders contained tutorials, example files and sample VSTi plug-ins in PC format. Although VST Instruments and effects are rarely open-source or written specifically for Linux, they can be run on Linux systems as long as the binary format matches that of the host CPU. Fervent Software also support the Rosegarden project, so it's no suprise that this MIDI + Audio sequencer, with classical notation support, is at the core of Studio To Go. Audio recording and editing programs include Ardour, Audacity, Sweep and Rezound, providing a choice of both destructive and non-destructive, disk-based and RAM-based editing. A collection of soft synths, including the Hydrogen drum machine and native DSSI plug-in instruments, means that there is plenty of software to make music with, and VSTis can also be loaded from the host machine's hard disk. 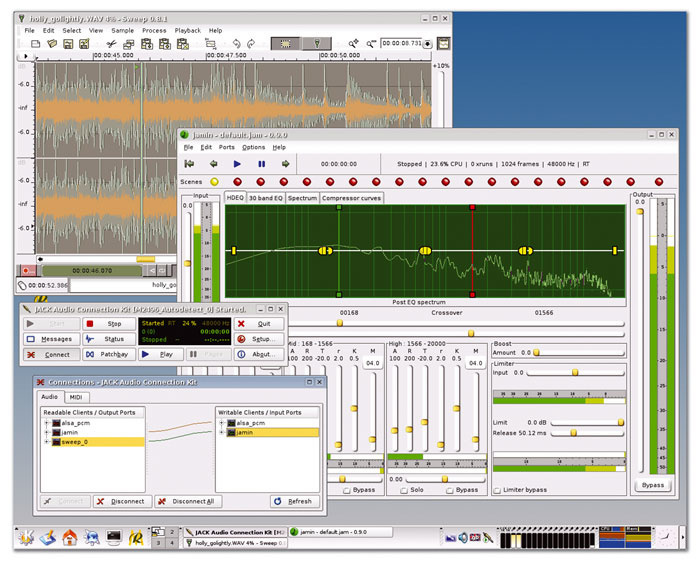 Utilities such as software mixers for sound interfaces are included, and there is also a collection of general-purpose tools including Konqueror, KDE's combined file manager and web browser. Ultimately, the portability advantages of Studio To Go will be constrained by the quality and Linux-compatibility of the PC hardware that you have access to. The price-to-storage ratio of USB memory sticks tends to make the combination of Studio To Go and one of these more suitable for MIDI work than lengthy multitrack audio sessions, and I suspect most people who want to use the software seriously will take the step of installing it permanently to a hard disk. However, running Studio To Go from the CD-ROM is a quick, easy and reasonably priced way of taking a look at Linux music software, or testing the suitability of your PC for running it. Easy introduction to Linux audio and music tools. Hardly any configuration or Linux skills required. Cost-effective compared to time spent getting a DIY Linux music system working. Official technical support, rather than community support. Only as good as the hardware of the PC you run it on. The suitability of any given PC for real-time audio can be unpredictable. Loading from CD-ROM can be slow on older machines. No support for some audio hardware, including all MOTU and Firewire interfaces. A lot of software for under £50, and far more complete than any proprietary bundle. If you're interested in using Linux for music but fear the amount of new skills required, this could be the product for you. Fervent Software +44 (0)7905 932630.